Brick Lane may seem like a photographer’s dream, but the challenge is in discovering interesting things to capture which haven’t already been photographed by every other tourist with a camera! Huge standout pieces are startlingly beautiful, but my imagination is captured on a smaller scale by chance compositions such as this combination of paint, advertising and graffiti tagging; dwarfed by high-profile street artworks it comes together seemingly unintentionally to create an almost pop-art contemporary work. Laying on the grass on a sunny day at a festival, I took this photograph of my sister Holly as she danced standing above me. The angle entirely distorts the scale of her actual physique and although naturally tall, it portrays her height as positively monumental. The odd angle somehow expresses her figure and clothing in an almost landscaped manner; undulations of folds appearing somewhat mountainous. The fact that her face is partially obscured only adds to the emphasis of her stance and the vibrancy of the bright colour juxtaposition. Anyone who has visited Dungeness will remember it by its flat and barren nature. 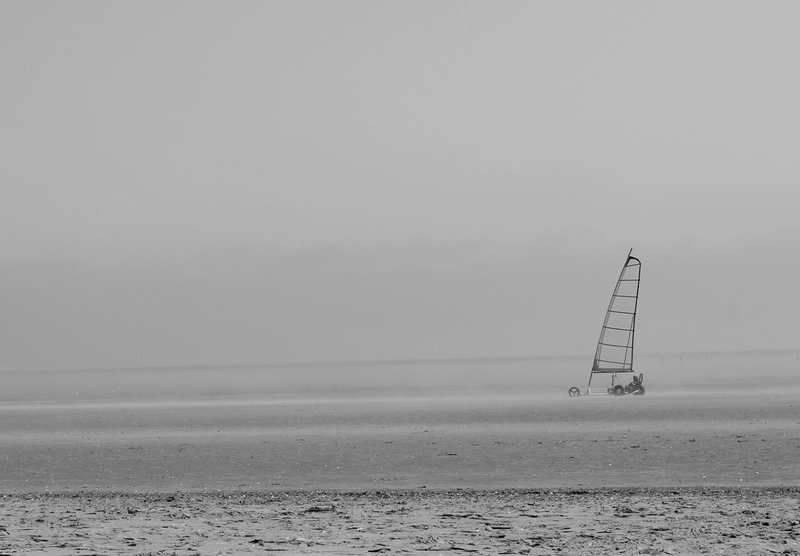 This photograph, taken on the beach through a warm mist, exemplifies the sense of isolation inherent in the seaside town. The parallel stacking of the horizontal linear marks created by the variation in the density of the sand creates an entirely abstract element from which the stark verticals of the windsurfing kart protrude dramatically. The absence of colour in the image adds to the sense of desolation and enhances the geometric nature of the composition. I am always fascinated primarily by circumstantial compositions which encapsulate a moment, or which seem to have been created or placed by an unseen hand. 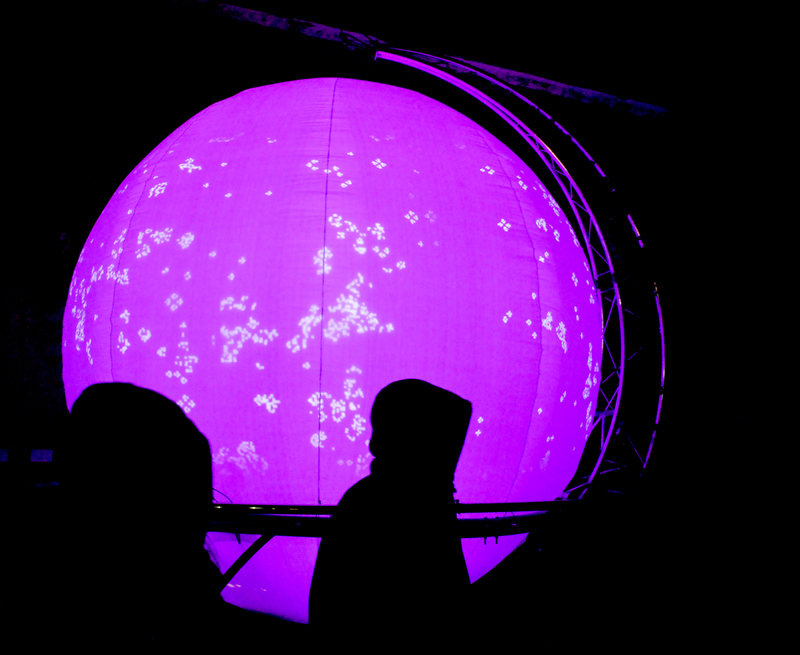 This photograph, taken at the Blinc Festival in Conwy, wales, captures a hooded figure silhouetted against one of the exhibited pieces around the town. Aside from the pleasing aesthetics (the alternate black against the deep purple and curves against lines portraying an almost space-age like imagery), the connotations struck me as interesting; the attitudes which fuel our modern day witchhunt against ‘hoodies’ imbue this image with a sinister undertone (silhouetted hoodie/unseen face), yet the reality was, of course, entirely different. Taken in a side street just off Brick Lane, this image captures the humour inherent in much of the artwork around that area. As well as high-end, large scale pieces such as the giant stork, there are hundreds of small individual pieces which encapsulate the tone of the area; figures and characters dotted around, reappearing in various guises and situations and becoming almost envisionings of living creations. 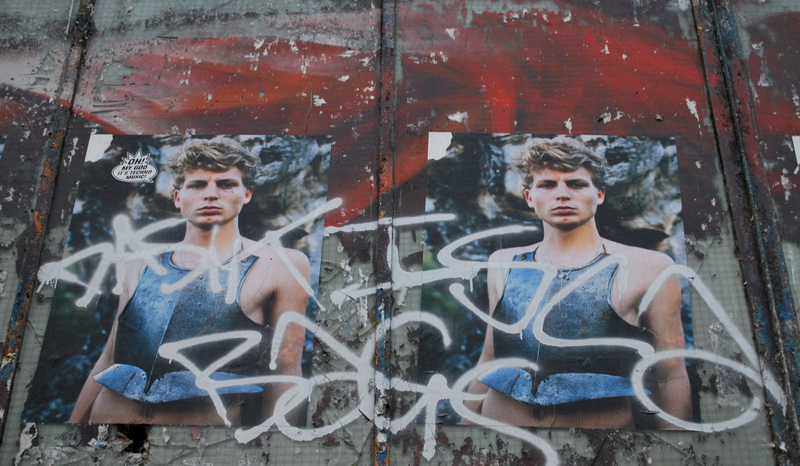 In this image there appears a blurring of the boundaries between the real and the imagined. 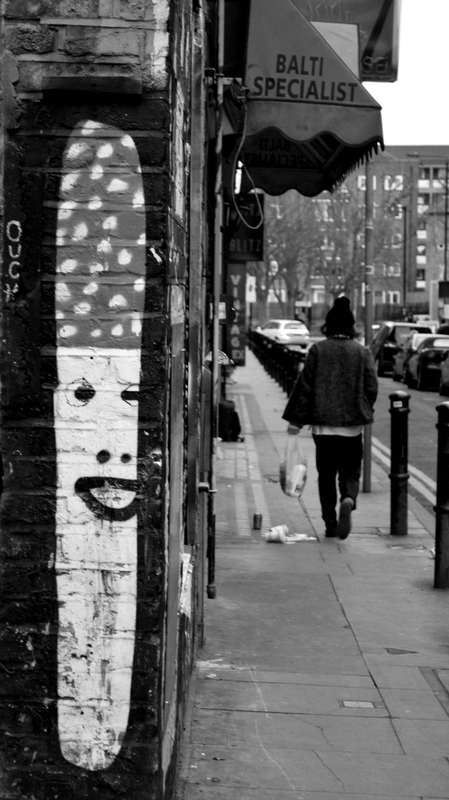 I see the walking man and the graffiti as intrinsically entwined; both part of the fabric of the streetscape and both characters in my created image. My favourite type of image is one such as this; created by chance, by a combination of weather, nature and human impact and resulting in a beautifully startling moment. 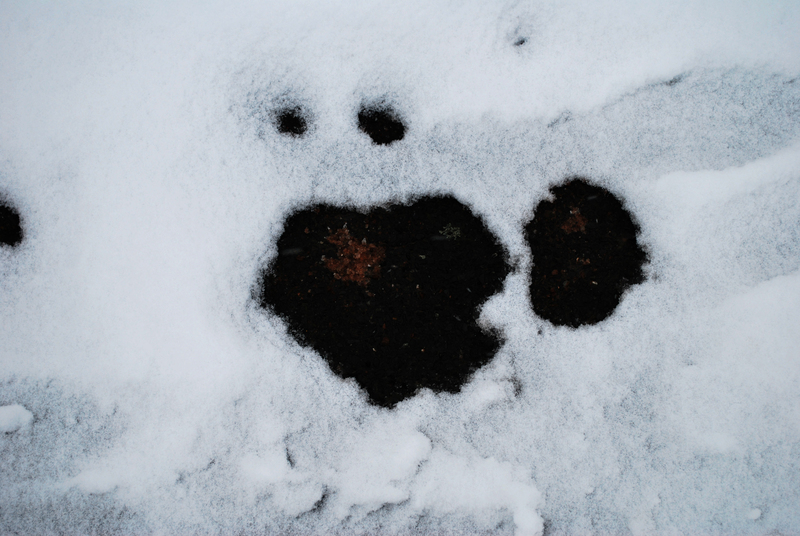 As the winter snow started to melt, I spotted this image, the tarmac underneath revealed to create the image of a gaping mouth, the overall effect reminiscent of a Mr Men character. I am a big fan of Andy Goldsworthy and his landscape interventions which produce art in nature using materials found nearby. However, I like to take this one step further and not intervene at all, but to discover; to look carefully and find unusual and artistic compositions such as this which are naturally occurring. 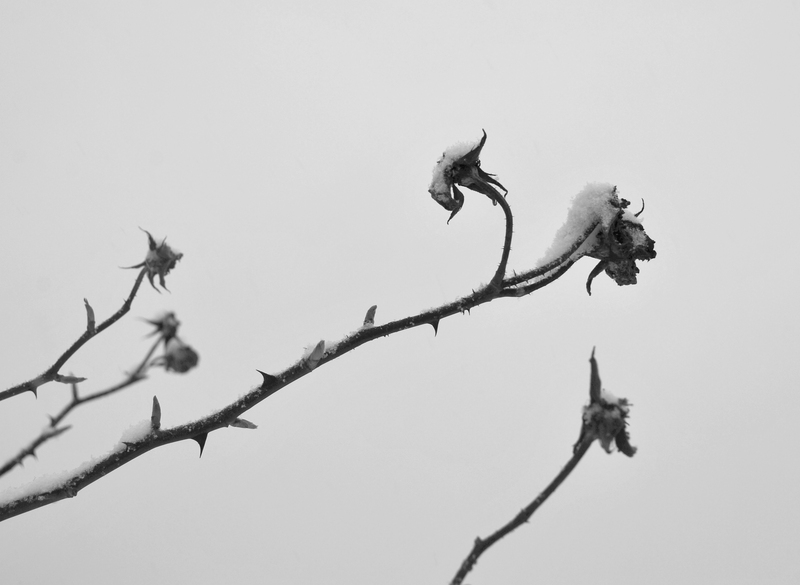 The contrast between the threat of the sharp rose thorns and the purity of the white snow scattered on its tips instinctively brings to my mind the fairytale stories of my childhood; the ever simplistic contrast of good and evil is reflected not only in the materialism of sharp and soft but also in the monochrome tones of the image. Backed by a grey winter sky the traditional beauty of the rose has died; turning the power struggle on its head, the snow, with its seemingly gentle demeanour, has succeeded in destroying the flower’s primary function. The story which unravels challenges assumption and prejudice and forces us to re-assess traditional ideas of beauty.